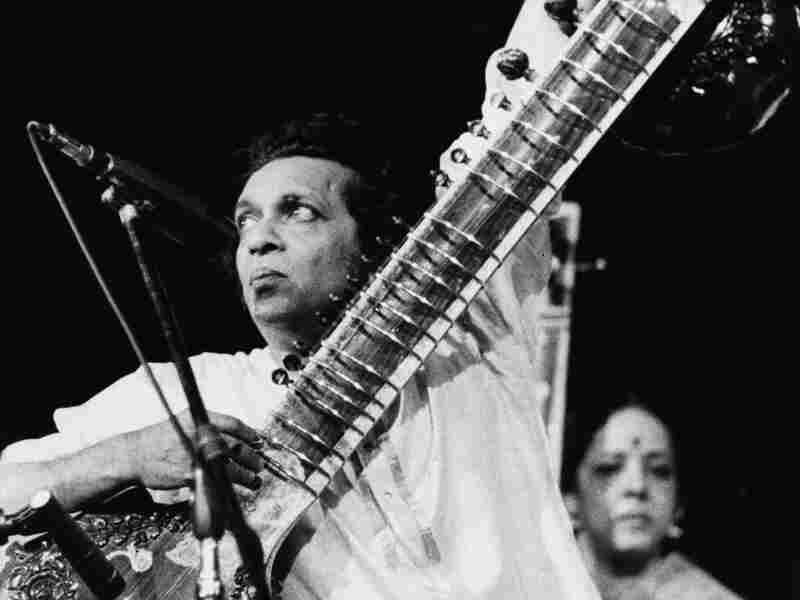 Sitar Virtuoso Ravi Shankar Dies At 92 : The Two-Way He was responsible for making Indian classical music popular in the West, collaborating with artists as diverse as The Beatles and Yehudi Menuhin. Musician Ravi Shankar performs at the Concert For Bangladesh benefit at Madison Square Garden in New York on Aug. 1, 1971. Shankar died Tuesday. He was 92. Sitar maestro Ravi Shankar has died. He was 92. A tweet from Prime Minister Manmohan Singh's official Twitter account broke the news to the world: "Prime Minister condoles the passing away of Pandit Ravishankar — A national treasure and global ambassador of India's cultural heritage." The Hindu newspaper reports that Shankar died Tuesday in California. He'd been admitted to the Scripps Memorial Hospital in La Jolla last week after complaining of breathing difficulties. Shankar was responsible for making Indian classical music popular in the West, collaborating with artists as diverse as The Beatles and Yehudi Menuhin. He's survived by his wife, Sukanya, and his daughters, sitar player Anushka Shankar and singer Norah Jones, three grandchildren and four great-grandchildren. From New Delhi, NPR's Julie McCarthy tells us that "India is eulogizing the man whose musical discipline and sense of spiritualism set him apart. The country mourned Shankar's passing 'as the end of an era.' Prime Minister Singh added in another Twitter post that Shankar will be remembered for his unsurpassed genius, "his art and his humility." A headline by The Times of India remind readers that Beatle George Harrison called Shankar "the godfather of world music." On Morning Edition, NPR's Susan Stamberg profiled Shankar. As she said, his music "is like a fine Indian sari — silken, swirling, exotic, it can break your heart with its beauty."